Yelloh Village Le Serignan Plage is an outstanding, 5 star, large and very popular campsite that occupies a truly wonderful location on the south coast of France. As a member of the Yelloh Village group of campsites, the range of activities and facilities available at the campsite, as you would expect, are second to none. The campsite is also superbly landscaped and well maintained. Trees, bushes and pleasantly coloured flowers separate the pitches and adorn many of the open spaces in the campsite. Not only does the beautiful foliage promote a real sense of luxury but also provides visitors with some welcome shade from the warm summer sun. On site facilities at Yelloh Village Le Serignan Plage include a number of bars and restaurants, a supermarket and even a bakery, butchers and fishmongers. This fantastic array allows you to either cook your own food or take the hassle out of your holiday and get someone to cook it for you. There are lots of reasons as to why Yelloh Village Le Serignan Plage campsite is so popular with families but the main one is its direct access to what is possibly one of the best beaches in the whole region. Long and covered in glorious, golden sand, the beach makes the perfect place for families to enjoy their holiday. Sit back and relax with a spot of sun bathing, take a dip in the warm Mediterranean waters, build sandcastles or just have bucket loads of fun, the choice is yours. The other main reason is the campsites fantastic swimming pool and wellness areas. This fabulous water park offers no less than 4 swimming pool, waters slides, children’s pools and water jet splash play area. 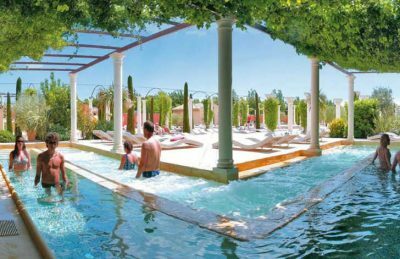 You’ll also find a stunning Romanesque styled wellness area which is perfect for recharging your batteries whilst the kids have fun in the family pools. Yelloh Village Le Serignan Plage campsite offers a comprehensive selection of activities and facilities on site and also nearby to ensure you have a fantastic family holiday. On-site activities at Yelloh Village Le Serignan Plage campsite include table tennis, tennis, pottery, volleyball, basketball, wellness area, gym, boules, playground and cycle hire. Facilities available at Yelloh Village Le Serignan Plage campsite include WIFI, restaurant, takeaway, bar, groceries, hairdresser, butcher, fishmonger, games room, tv room, animation team, washers and dryers. Accommodation at Yelloh Village Le Serignan Plage campsite includes a range of 2 and 3 bedroom mobile homes and lodges that are available from Al Fresco Holidays and Suncamp.